It’s become common to say that the NHL is getting younger. It’s an understandable assumption. Recent work has shown players peak earlier than previously believed, and young stars breaking into the league have received a lot of media attention. But is it actually true? How has the league’s average age changed over time? And are there any trends in team age that lead to overall success? This post has 2 parts. First, I used Hockey Reference data to create weighted ages for the past 31 seasons. I also look at a smaller but richer dataset from War On Ice to show that these weighted averages do not meaningfully vary regardless of the measure used for the weighting. Second, I looked at whether teams who performed well in a given year had any particular age compared to the rest of the league. I found that from the mid-1980s to 2005, the NHL gradually got older from an average of 25 to 28. In 2005, the salary cap was introduced and the trend towards older players reversed. Instead, the average age fell by about a year between 2005 and 2010 and has remained flat since. Despite perceptions, the league has been staying at about the same average age for the past 5 years. Finally, the teams that performed well in the playoffs were not consistently older or younger than the rest of the league. *Writing this sentence guarantees that Boulton will play another game between me drafting and publishing this post. My apologies, Islander fans. In sum, all of the different measures show the same trends. While not surprising, this rules out the possibility that, for example, younger players were producing a greater share of the league’s points but not getting additional ice time. 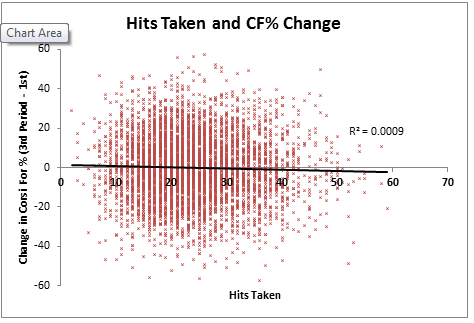 Overall, this shows that there’s no significant downside to using Hockey-Reference’s shots on goal as a weight. It does not deviate much from preferable non-financial measures. The contending teams tend to be slightly older than the rest of the league, but this is not always true and it is not by a large margin. Overall, I am reluctant to conclude that a particularly old or young team is beneficial. No GM is going to make decisions based on his or her team’s average age, but it’s still an interesting topic from a descriptive perspective. I found that the age of the league has remained flat for the past few years, which is contrary to what many people believe. It remains to be seen if this trend will continue in the years to come. I would not be surprised if the increased use of analytics in NHL front offices lead to a shift towards even younger players on favorable contracts. While not the most in-depth topic, there are a few other items that could be explored. First, it could be worth investigating the age distribution within each team rather than just the average. Second, in a future post, I’ll break down these weighted averages by team so that everyone can see how a team is structured compared to the rest of the league. At this level, there are also some interesting differences between the different weight measures. All of the data files and R code used in this post are available on Dropbox here. Player usage charts are one of the seminal works of data visualization in hockey. Created by Rob Vollman and automated by Robb Tufts here, these charts provide a simple look at the role played by each skater on a team. For the uninitiated, the axes of the standard player usage charts show offensive zone start % and quality of competition (relative corsi). The former is designed to give a sense of how often the player is relied on for offense or defense, and the latter shows the skill level of the player’s competition. I suspect people look at player usage charts for one of two reasons. First, they want to see how a coach is using all of the players he has available, e.g., “Vancouver tries to give the Sedins the best offensive opportunities and has Manny Malhotra take on the tough defensive assignments. Second, they want to provide additional context for a player’s performance in other measures, e.g., “Manny Malhotra’s Corsi For % is only low because he starts every shift in the defensive zone against the toughest competition”. Micah Blake McCurdy presented work at the RIT Hockey Analytics Conference showing that zone starts don’t really matter. We would only need to make very small adjustments to account for the role of zone starts in explaining any variations in a player’s performance. In addition, faceoffs account for less than half of all shift starts and not all faceoffs are also shift starts. Conor Tompkins showed on hockey-graphs.com that quality of competition does not significantly vary between players in a large sample. Over the course of a season, coaches do not have enough control to regularly shelter some players while assigning the toughest minutes to others. These two items have left me reluctant to use player usage charts for evaluation. Instead, I wanted to look into an alternative view that might effectively provide context for skater usage. In place of zone starts on the x-axis, I’m using a measure based on player allocation in different score states: TOI % leading – TOI % trailing. This is used by Dom Galamini on his popular HERO charts, and I think adequately does the job here. It shows who a coach turns to when the team needs to come from behind or protect the lead. I also think it does nicely when used for player evaluation because differences in deployment by score status are easily corrected for by looking at score-adjusted figures. In place of the y-axis, I used Quality of Teammates. Obviously, this does not even try to measure the same thing is Quality of Competition. However, it does provide useful context for how a player is being used, and it does not have the same distribution problems as QoC. The effects of teammates are observable over the course of a season. As Garret Hohl points out here, there are still times when looking at QoC is valuable, but if I had to pick one I’d take QoT. In addition to the axes described above, the size of the bubbles represents average TOI per game and the color shows relative Corsi For %. Asterisks on player names means that that player was on multiple teams this season, and they should be compared to his teammates with caution. All of these features were developed in the original player usage charts and I’m adapting them here. All data shown is score adjusted data from this season and is from War-On-Ice as of January 13th. To be clear, these are intended to be an additional tool for understanding player usage, not a complete replacement of the original charts. They are decidedly a work in progress rather than an unambiguous case for one method. The measures I use here are far from flawless, and in the case of the y-axis does not even capture the same attribute. I think that the measures worth included deserve a larger conversation, and ideally they would be shown to vary across players in a large sample and be meaningful in performance. Suppose the hockey gods gave you a choice: Your team could get 10 zone entries and take 1 shot each time, or it could have a single zone entry and take 10 shots. (Since these are the hockey gods, assume the team is allowed to score multiple goals on the one entry.) Which would you pick? It is possible that the single ‘high-shot entry’ would tire the defense and lead to better opportunities than attacking a fresh defense 10 times. If that’s the case, how many 1-shot entries would be equally valuable as the entry with 10 shots? Hockey observers are coming to see the importance of both shot volume and zone entries, but there are still significant gaps in understanding how they relate and how offense is generated. For example, little attention has been paid to the distribution of shots within zone entries. We have very limited quantitative knowledge of the value of ‘high-shot entries’ compared to low ones. In this post, I look at the frequency of achieving different numbers of shots on a single entry and the success rate of these entries. This is made possible by Corey Sznajder’s All Three Zones project, which you can and should support here. 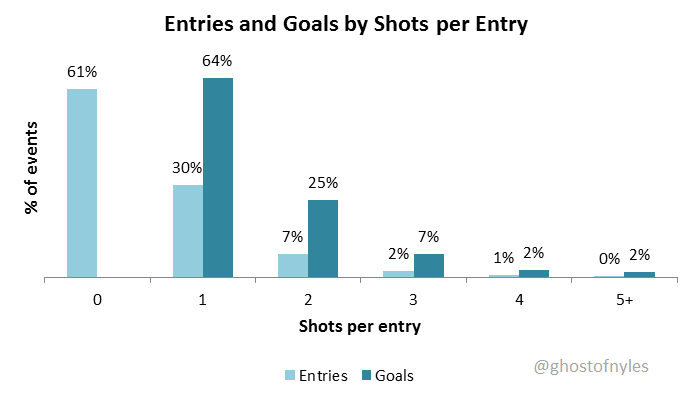 I look at two main questions: In Part 1, I examine how common it is to achieve each number of shots on an individual entry and which of these entries generate goals. In Part 2, I use this information to examine what exactly makes carry-ins more valuable than dump-ins. For this work, I looked at every regulation 5v5 entry in the All Three Zones project that could be clearly classified as either a carry-in or a dump-in. This gave me a dataset of 29,264 carry-ins and 57,693 dump-ins, which led to 2,965 and 1,364 goals, respectively. If the next entry/faceoff after an entry was an offensive zone faceoff, I gave the initial entry credit for shots and goals that followed the faceoff. Unfortunately, this does not distinguish between icings and stoppages where the defending team is able to change skaters, but this limitation seemed preferable to ignoring all shots that were preceded by a faceoff. Finally, all references to “shots” in this post refer to Fenwick For, as that is the measure tracked in All Three Zones. Fenwick includes both shots on goal and missed shots but, unlike corsi, excludes blocked shots. The spreadsheet with the main calculations and charts are available here. In addition, if you reach out to me and show you purchased the All Three Zones dataset, I’m happy to share the full spreadsheet in which I cleaned and analyzed the raw numbers. Part 1: How many licks does it take to get to the center of the net? How common are ‘high-shot entries’ in which the offense is able to take multiple shots before the puck is cleared out of the zone? And how important are they for scoring goals? First, it is important to recognize that entering the zone does not guarantee offensive opportunities. 61% of all entries are cleared out of the zone without a shot. Another 30% achieve only 1 shot. Considering these odds, any entry that includes at least one shot should be considered at least somewhat successful. The distribution of goals follows a similar pattern: most offense comes from low-shot entries. Almost two-thirds of goals were scored on the first shot following a zone entry, and another quarter were scored on the second. However, while shooting percentage increases from 5% to about 13% as more shots are taken, this increase is far less important than the volume of low-shot entries. In sum, we see that almost all entries lead to no shots or just one shot. When a team does get a lot of shots on a single entry, each additional shot has a higher chance of becoming a goal. An individual high-shot entry is more likely to end in a goal than a low-shot entry, but low-shot entries are so much more common that they are responsible for most goals. The data also answers the questions posed in the introduction. Entering the zone and taking 1 shot has an expected value of 0.05 goals. If we pretend that multiple goals could be scored on a single entry, then the 10-shot single entry would have an expected value of 1.06 goals. The 1 extremely long entry is therefore worth a little more than 21 1-shot entries. 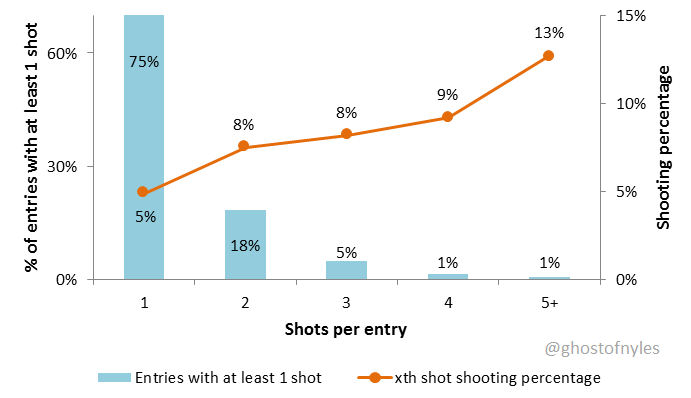 However, 1-shot entries are for more than 21 times more common than an entry with 10 shots. One key insight from hockey analytics has been the importance of carrying the puck into the offensive zone instead of dumping it in. The All Three Zones data supports this assertion: in the data I examined, 4.4% of all carry-ins led to goals compared to just 1.8% of dump-ins. More specifically, this data lets us explore how a carry-in creates more offense than a dump-in. Case 3: Carrying in increases the likelihood that the player will get at least one shot off. The data does not support cases 1 and 2. Carry-ins are no more likely than dump-ins to lead to high-shot entries. 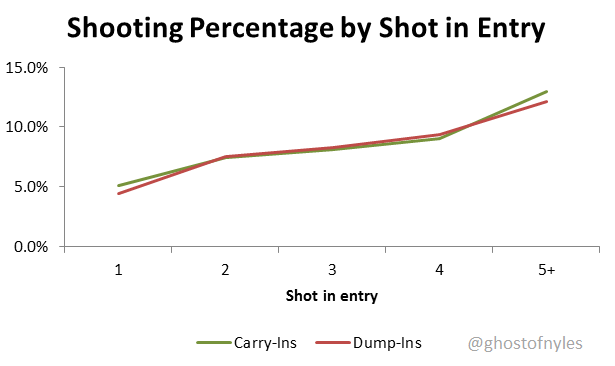 Furthermore, shooting percentage for each shot in the entry is nearly identical between entry types. 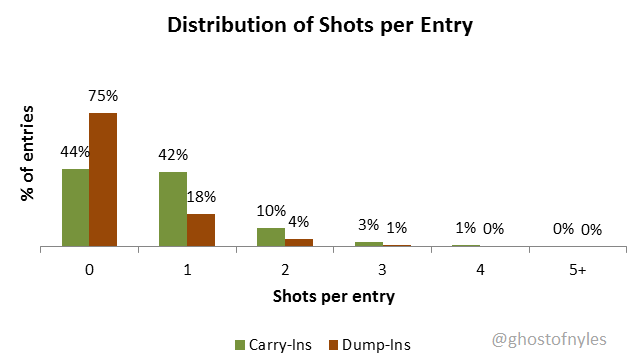 The first shot after a carry-in has a slightly higher shooting percentage than the first shot after a dump in (I suspect because the carries include shots on the rush), but the difference is not large enough to explain why carries produce so many more goals than dumps. Instead, the truth is case 3: carrying in the puck makes it significantly more likely that the offense will produce at least one shot. The defense successfully clears dump-ins without allowing a shot three-quarters of the time. In contrast, they do so for carry-ins just 44% of the time. These additional opportunities for one shot are a huge source of additional offense after a carry-in. These findings match the general analytical criticism of dump-ins: by voluntarily giving up possession, the offense gives the defense the chance to neutralize a potentially dangerous situation. These findings add some additional context to our understanding of zone entries and offensive production. 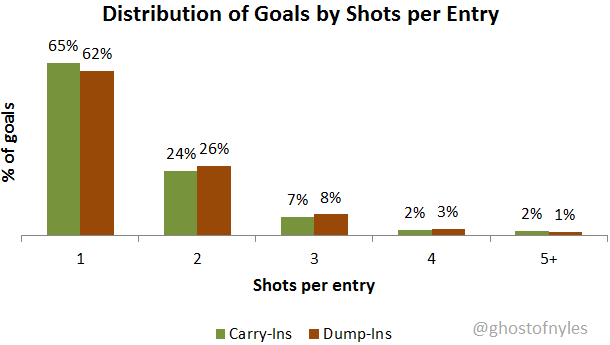 First, long shifts with multiple shots in a single entry are responsible for very little goal production. Second, carry-ins are more valuable than dump-ins because they are much more likely to lead to at least one shot before the zone exit. There is a bunch of additional work that could be done to build on this. First, this data could be split up to see if effects vary by team. Second, we could incorporate additional data such as score effects or special teams. Finally, it would be beneficial to try to incorporate different types of shots, such as rebounds and rushes. Physicality in Hockey: Is Hitting Valuable? How important is physicality for an NHL team? To generalize, this is a question that divides the advanced stats community from a lot of traditional ‘purist’ thinking. On one hand, it’s common to hear purists talk about the importance of grinding forwards who finish checks and intimidating defensemen who level their opponents at any opportunity. In contrast, analytics types point to hits that hurt possession rather than help it when the hitter takes themselves out of the play without gaining the puck. In this post, I try to assess the value of hitting based on the data currently available. First, I’ll take a brief look at the theoretical direct impact of a hit on the play in which it occurs. Second, the majority of the post will examine whether hitting effectively ‘wears down’ the opposition in a way that helps the hitting team as the game progresses. Both of these sections suggest that hitting has limited value for winning hockey games. I’ll end with a discussion of this data’s implications, its limitations, and possible next steps. The first effect of a hit is obvious: it separates an opposing player from the puck. If done skillfully, this can help a team gain possession of the puck and create offense. However, theory suggests that while this could be useful, it is not necessarily a positive move. Since the hitter is rarely in a position to gain control of the puck himself after a hit, the best he can hope for is to create a 50/50 loose puck in which one of his teammates gains possession. In cases where the hitter is ‘finishing his check’ after an opponent makes a pass or shot, the likelihood that his team will gain possession is even smaller; the hit may pressure the opponent to make a mistake, but the opponent has still already made a play and has probably sent the puck to a teammate as planned. In contrast, the hit, especially if it misses, can take the hitter out of position and give the opponent a better scoring opportunity. Advocates of hitting would claim that in addition to the immediate effect of a hit, it can also affect future play. Specifically, it can diminish the ability of the opponent. This is ‘wearing them down’, and weakening the opponent through pure physical pain and fatigue. This impact can also be psychological: an opponent may make worse plays or avoid the ‘dirty areas’ to avoid being hit again. This type of effect is more interesting to me because it is based in concepts that are rarely explicitly stated in sports. We use terms like ‘grind them down’ or ‘tough to play against’ as euphemisms for hurting the other team so that they’re less likely to win. It’s easy to see professional athletes as machines with set, constant abilities, but this simply isn’t the case. Players are humans, not video game characters with hard-coded stats. They’re just as prone to fatigue or psychological effects as anyone else. Indeed, one of my favorite parts of Justin Bourne’s writing is when he discusses the reality that players don’t like getting hit and will sometimes try to avoid it, even if it means not making the best possible play for the team. These ‘long-term’ effects of hitting can’t be measured in a single statistic, but they can still be studied. They are beneficial to a hockey team if and only if they help the team score goals and win games. If hitting doesn’t lead to goals then it may be very entertaining but is not a strategy that a team should pursue. In this post, I examine whether teams get ‘worn down’ or otherwise have their ability diminished over the course of a game by being hit. The data to study this is somewhat limited but not totally unavailable. First, I looked at the basic count of hits taken by a team in any given game (this and all other data in this post come from War on Ice). Instead, I calculated the change in Corsi For % for this team from the first period to the third period. This is obviously an imperfect measurement, but I believe it works to test the possible influence of hitting. Because this is by definition an effect that takes place over the course of a game, it should be measured by its effect between the beginning and the end. In the first period, the team has not been hit and is playing to its full healthy ability, regardless of the hitting tendencies of their opponent. The physical team’s strategy, if effective, would come to fruition later in the game after they have had the opportunity to hit their opponent. If a team is worn down by hitting, we would see their play worsen over the course of the game. As you can see, there’s no clear relationship. The R2 value is just 0.0017, which means that being hit explains basically none of the variation in how a team performs between the first and third periods. This suggests that hitting does not have its desired long-term physical effects. A team’s third-period performance has nothing to do with how much they’ve been hit during a game. To be clear, this is far from perfect analysis. First of all, the data is not ideal. Hits taken is not a particularly reliable stat and is known to vary between arenas. Even if every team’s scorekeeper had the same objective standard for what constitutes a ‘hit’, hits taken would not distinguish between a soft tap along the boards and a bone-jarring collision. Essentially, ‘hit quality’ is ignored. Second, while I believe that calculating the difference between first and third period play is a valid course of analysis, it’s not perfect and could likely be improved upon. I tried to limit the influence of other factors, such as the general correlation between hits taken and positive possession, but it may still be flawed. Nothing here is absolute proof that hitting never matters, and it shouldn’t be construed as such. 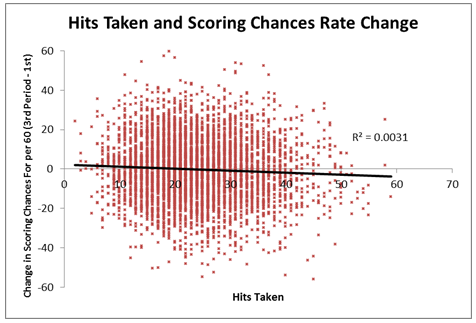 That being said, this data does point in a single direction: hitting is not a particularly valuable strategy, and does not have an effect beyond the play in which it occurs. The conventional wisdom that you need to ‘set the tone’ or ‘grind them down’ just doesn’t hold up in any way that’s visible in the actual results of the game. There are a few ways this work could be advanced. First, more could be done to study the immediate impact of a hit, and how likely the hitter’s team is to gain possession of the puck. I tried to look at this by studying the next event after a hit in the NHL play-by-play files, but this wasn’t valuable because it excluding turnovers that happened after a hit but before the next shot. Ideally, this would be studied by a full tracking project. Second, this analysis focuses on the team level, and it’s possible that a study of individual players would reveal skaters who are more likely to experience a drop in play after being hit. Finally, I’m curious about the results of studying the ‘cumulative hits’ that a team takes over the course of a season rather than in a specific game, but I did not dive into this area because even if this relationship did exist, it would not suggest that any specific team benefits from having its players do the hitting. Overall, is any of this convincing? How could it be improved? Just how unreliable is hits taken as a statistic, and is there any better measure of physicality? Is there a way to improve the y-variables I studied, either by selecting different metrics or by calculating the change over the game in a way other than my ‘3rd period – 1st period’ method? Ryan Stimson recently shared the results of his passing project, a great piece of work that’s collected some really interesting data. Spencer Mann followed up by creating some visualizations to summarize the key findings for each player. This data deserves to be used more, so I wanted to try it out on a fairly small question: what does it tell us about the currently available free agent defensemen? As Ryan lays out in his posts, passing is a significant aspect of offensive production, so this data may offer more information than shooting metrics alone. The data does not cover every game last season, so there are some limitations. Anton Volchenkov and David Schlemko are both excluded because they both have less than 100 min of tracked 5v5 time. (Want to help fix that for next season? Ryan is currently looking for more volunteer trackers, which will be a huge part of how much data is collected moving forward) Regardless, the data as it currently stands has some interesting points to show. 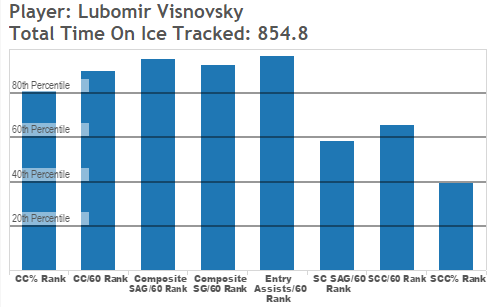 Lubomir Visnovsky is a great offensive contributor with elite zone entry numbers. He’s also excellent on the power play and would provide significant offensive output for any team that signs him. At 38 years old, he is likely looking for a one-year deal, so a team with cap space should be able to acquire him without a long-term commitment. The primary concern, and likely the reason he has not yet been signed, is injuries. Visnovsky has missed significant time due to injuries in the past few years and did not finish the Islanders first round playoff series due to a concussion. He’s not a shut-down guy and would likely not play a full 82 games, but he would definitely provide value for a team that expects to make the playoffs and is looking for an offensive boost. Christian Ehrhoff has had less time tracked than the previous two UFAs, but he did very well in the games that were tracked. 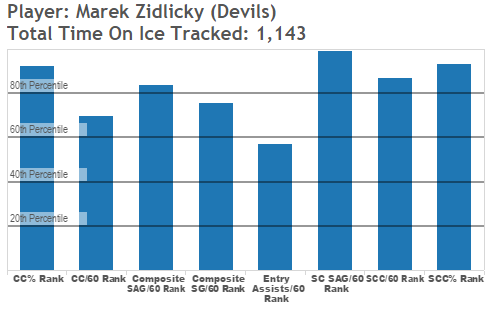 Many of his stats are quite similar to Zidlicky but a bit lower overall, especially SC SAG/60. On the other hand, he was much more active in created controlled zone entries. 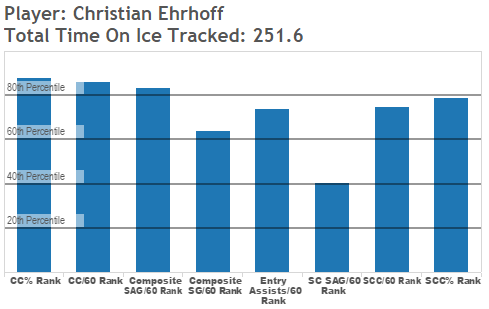 Overall, this backs up a general assessment of Ehrhoff as a very good but not spectacular defenseman. Franson, like Ehrhoff, has limited tracked time, and his numbers are very interesting. Franson has the greatest disparity in his rankings between different statistics: the middle four are great while the right two columns are awful. 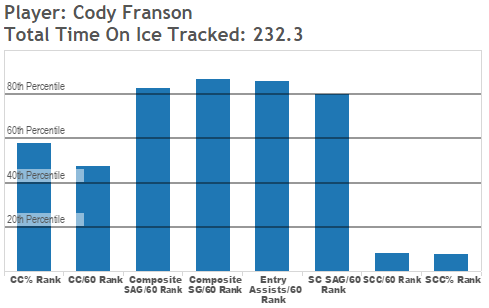 At 27, Franson is unlikely to significantly improve in the future but should remain productive for several seasons. The talent pool for UFA defensemen drops off considerably after the top 4 options. 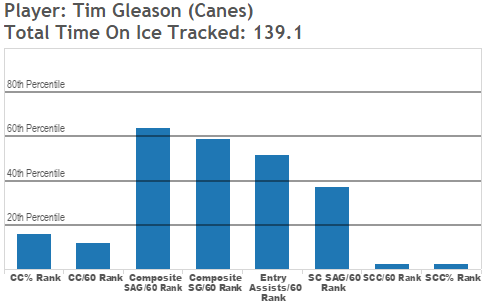 Tim Gleason’s stats across two teams suggest a third pairing guy. 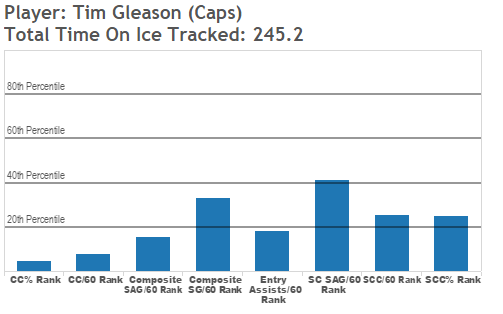 The distribution of the stats is similar to Franson’s, but Gleason’s stats are worse across the board. NHL.com’s article on remaining free agents called him a “cheap, veteran 3rd pair”, which seems about right. Andrej Meszaros has almost identical stats as Gleason though he is a bit stronger on controlled zone entries. 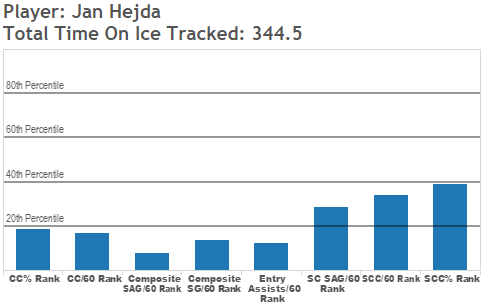 Jan Hejda’s passing summary is flat out bad. At 29 years old, it does not seem like he would add much. While there’s limited passing ability from defensemen still available on the free-agent market, there is definitely still some talent to be had. That is particularly true for teams looking for a veteran player for a year or two rather than a younger player to commit to long-term. One interesting finding from these summaries is that the two older players – Visnovsky and Zidlicky – did better than would be expected by their general reputation among fans. Given the focus on passing in this data set, I’d guess that these vets rely on passing as a way to produce offense while limiting skating, and thus conserving energy. SportLogiIQ just had a post on Duncan Keith’s playoff performance and suggested that he conserved energy by passing rather than rushing the puck. It would be interesting to examine the data further to see if the same holds true across the regular season for Visnovsky and Zidlicky.